As depicted by an unknown Artist. King David's son, Solomon, inherited a unified prosperous kingdom and his reign became known as Israel's golden age. Building on David's achievements, he established an efficient centralized government, with a professional army and an advanced trade network. Above all, he lavished attention on Jerusalem, raising splendid public buildings and palaces, and carrying out his father's plan to erect a Temple for the Lord, worthy to house the Ark of the Covenant. The Bible provides a vivid description of the Temple's dedication in 1 Kings 6-8. Around 950 B.C., and after seven long years of construction, all Israel came to witness this day. Solomon's Temple, House of the Lord, awaited God and king atop the holy Mount of Moriah above the city of David. The autumnal sun of the new year bathed the Temple's splendid limestone and burnished the bronze columns that framed its massive doors. So many animals were offered during the eight days of celebrations that they can not be told nor numbered for multitudes. The flames and smoke, wafting the savor of roasting meat, rose over the city from the altar. In the midst of the celebrations and accompanied by the sounds of trumpet, pipe and cymbals, the Ark was brought into the Temple. For the Lord hath chosen Zion; he hath desired it for his habitation (Psalms 132:13). Solomon led the procession of the elders and heads of Israel's tribes behind the Ark. The Temple's gold-inlaid doors swung open as the Ark was brought into the large vestibule and finally into its resting place inside the Holy of Holies. Solomon's Temple made Jerusalem not just another capital, but Israel's religious center - as it remains to this day. Later it would become a holy city' for Christians and Muslims as well. Solomon's Temple was destroyed by Nebuchadnezzar in 587 B.C. The Temple was later rebuilt twice and then destroyed by the Romans who built a pagan temple on its site. Today a splendid Muslim mosque, the Dome of the Rock, covers the site. Though not a stone of Solomon's Temple has been found, it is possible to reconstruct the Temple with great accuracy due to biblical descriptions and archaeological evidence from elsewhere. The Temple was a most spectacular and expensive construction project. If you could walk inside, all that you would see would be gold! The walls, the ceiling, even the floors were all covered with gold. Silver was nothing accounted of in the days of Solomon, He overlaid the (holy of holies) with pure gold...Solomon covered the inside of the Temple with pure gold...He overlaid the whole interior with gold...He also covered the floors of both the inner and outer rooms of the Temple with gold 1 Kings 6:20-30. The Bible also tells us that Solomon called upon King Hiram of Tyre, who had been an alley of David, to help build the Temple. Israel had no experience in designing such lavish structures so Hiram supplied not only his cedar wood but also architects and artisans. As a result, Solomon's Temple essentially followed the plan of a Phoenician temple. The hiring of outsiders to build Israel's First Temple helps to explain the use of ornate doors, columns and religious symbolism foreign to the Hebrews' long practice of artistic ritual. Though the Israelites called their temple the House of the Lord, they only thought of it as the place where God's Name dwelt. The mystic presence of the name hallowed the temple as a house of prayer where God, in heaven, could also tent among His people. Hiram's designers had a different approach. They conceived the Hebrews' God as a sovereign in his palace. They placed the Ark under the guard of winged sphinxes of Phoenician iconography: Cherubim, mythical creatures symbolizing omnipotence. The Cherubim combined in idea and shape the strength of the lion, the swiftness of the eagle, the procreative power of the bull and the wisdom of man. The imported Phoenician artists delicately blended Egyptian and Asian motifs. The Egyptians supplied the idea of lighting the temple's interior only from windows under the roof - the ancient origin of the cathedral's clerestory. Babylon's reverence for the life-giving sea probably inspired the name of the Temple's great copper basin - the Molten Sea. The bowl weighed nearly 30 tons and held some 10,000 gallons of water . 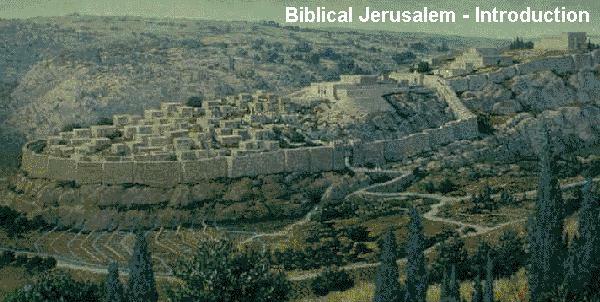 Solomon enlarged the city of Jerusalem in his renewal of the City of David. Year after year, his royal palace rose in stone, wood and gold: the House of the Forest of Lebanon, an aptly named council chamber of cedar, pillared like a grove and the adjacent Hall of Judgment, where he sat on a throne of ivory and gold to receive his guests. For his many foreign wives he built magnificent homes and shrines. All these buildings stood as monuments to Solomon's grandeur - and to Israel's eventual bankruptcy. He drained the treasury to sustain a lavish royal court, and on the profits of selling the trapping of glory, the Phoenicians prospered. Solomon paid on the installment plan for the skills of Hiram's artisans and for the cedars rafted to Joppa port. Each year Hiram received twenty cors of wheat...and twenty thousand cors of beaten oil (1 Kings 5:11). These payments equaled 125,000 bushels of wheat and 1,200,000 gallons of oil. After 20 years Solomon still owed Hiram. Desperate, but shrew , he ceded to Hiram twenty coastal towns in the Western Galilee. Ultimately, Solomon had to raise new taxes and his people were made to pay for his extravagance. Each of the 12 administrative districts of Israel provided Solomon and his court with supplies. Centralized government replaced the tribal league. Officials roamed the realm and levied taxes of all kinds, much of it in grain. They channeled Israel's wealth into store cities built in each district. Israelites also paid with their own toil: Solomon raised a levy of forced labor and sent 30,000 men to cut down cedars in Lebanon and 150,000 to hew and haul stone from the hill country. But he gave them what his name means in Hebrew: peace and prosperity. And Judah and Israel dwelt safely, every man under his vine and under his fig tree, from Dan even to Beersheba, all the days of Solomon (1 Kings 4:25). Fortified cities were built around the borders. The most important were Gezer, Megiddo and Hazor. His well -equipped army of 1,400 chariots and 12,000 horsemen never had to fight a major war. For centuries Israeli farmers had reaped with flint sickles. Now grain fell under their iron blades. No longer could it be said there was no smith found throughout all the land of Israel (1 samuel 13:19). For David had vanquished the Philistines, who guarded iron ores and the secret of smelting it. Solomon exploited the lodes of the Promised land, whose stones are iron, and out of his hills you can dig copper (Deuteronomy 8:9). Solomon's legendary copper mines were probably located at the Jordan Valley. There, the Temple's great copper basin, its two huge pillars and other bronze vessels were cast (1 Kings 7:46). The city of Etzion-Geber, on the Kingdom's southern tip, was Solomon's Red Sea fleet home base. Solomon made a navy of ships in Ezion-Geber...on the shore of the Red Sea (1 Kings 9:26). The fleet was manned by Phoenicians and sailed towards Africa and Arabia. The ships brought gold, precious stones, special wood, spices, ivory and apes to amuse the court. Solomon fostered trade on land as well. The land of Israel has always been the hub of the Middle East. Through it passed caravans linking Mesopotamia, Syria and Egypt. And when the queen of Sheba heard of the fame of Solomon...she came to Jerusalem (1 Kings 10:1). Romance and pageantry dramatized the queen of Sheba's summit with Solomon. Their meeting was immortalized by the Bible and modern works of art. The kings of Ethiopia still claim descent from a son of Solomon and the queen of Sheba. The kingdom of Sheba was probably located in today's Yemen, some 1,200 miles south of Jerusalem. The queen gave the king an hundred and twenty talents of gold, and of spices very great store, and precious stones (1 Kings 10:10). I believed not the words until I came said the queen, astounded by the splendor; and behold, the half was not told to me. The queen tested his wisdom to prove him with hard questions. The meetings must have gone well for Solomon gave unto the queen of Sheba all her desire, whatsoever she asked. Solomon shone in Israel's memory as a man wiser than all men. Tradition credits him with the Proverbs, Ecclesiastes and the Song of Songs. As the king grew old, his hold on Israel weakened. Rebellions erupted on the border provinces. The Bible gives us the reasons for the king's downfall. He loved many strange women and he allowed them to continue their own forms of worship, defiling the Holy City with their foreign rituals and gods. And the aging Solomon not only tolerated this paganism but also indulged in it himself. Solomon had 700 wives and 300 concubines. Many of the exotic women were in fact living treaties. He maintained alliances by taking wives from the family of every potentate willing to sign a treaty. He even kept Egypt out of Israel by marrying an Egyptian princess, a daughter of a pharaoh. Nevertheless, the Lord promised, For as much as ...thou hast not kept my covenant... I will surely rend the kingdom (1 Kings 11:11). Soon after Solomon's death, in 922 B.C., the northern tribes of Israel formed an independent kingdom rival with the southern kingdom of Judah. Solomon's Temple was destroyed, his kingdom split in two. But his glory - and his realm - would live on forever, in the chronicles of his temple and the sagas immortalized by the Bible. The glory would endure in the memory of the king of whom it was written: there was none like thee before thee, neither after thee shall any arise like unto thee (1 Kings 3:12).